Lyerly’s Cleaners is Charleston’s Premier Dry Cleaners. 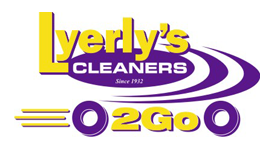 Lyerly’s Cleaners is Charleston’s most prestigious and convenient cleaners. We have built our 80 year reputation on superior customer service with the highest standard of quality. We pride ourselves on our integrity and genuine commitment to the community. If you are new to the area or in search of a convenient dry cleaners, we’re certain that we will exceed your expectations. Come in to any of our 7 convenient locations, or call our FREE Pick-up and Delivery service today. At Lyerly’s Cleaners your feedback concerning our service and quality performance is of utmost importance to us. In order for us to continue to offer the finest service in the area, we need to know if we are meeting the needs of our most important business partner, our customer. Please offer your candid review of how we recently measured up to your expectations and how we might improve our service excellence to you in the immediate future. We appreciate your input and want to thank you for choosing Lyerly’s Cleaners.